Community request cards are small, portable cards that can be used in one’s community to access goods and services. Background: Community request cards are small, portable cards that are used to access goods and services in one’s community. Each card typically consists of a simple request paired with a corresponding image. They are intended to help individuals with complex communication needs to be more independent. Population: Individuals of all ages with communication disorders or cognitive difficulties. Description: Community request cards can be used for a variety of interactions, including: making a simple purchase, using public transportation, participating in community activities, or asking for assistance. Determine the messages the individual needs to communicate to complete this activity with greater independence. Write or type the requests on small cards using concrete, concise language. This will make interactions simple and efficient. Draw or include a picture which illustrates the request. 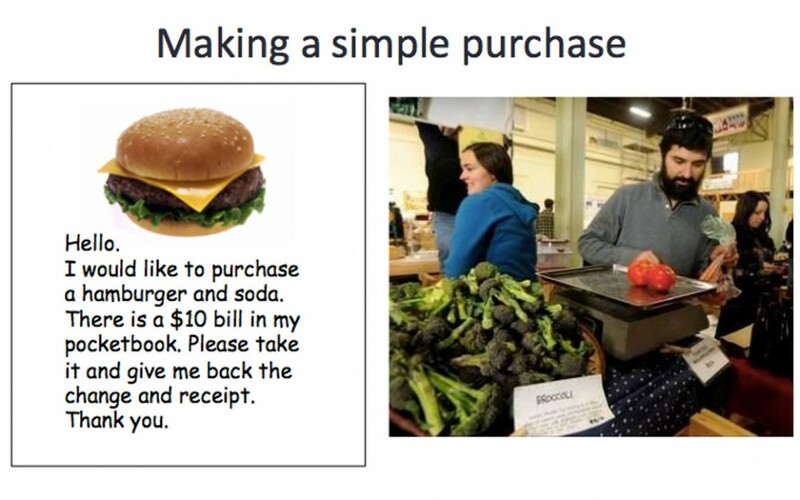 Adding an image supports understanding by both the user and the vendor or community worker. Making a purchase: Hello. I would like to purchase a hamburger and soda. There is a $10 bill in my pocketbook. Please take it and give me back the change and receipt. Thank you. Using public transportation: Hello. I would like to add $20 to my MTA Metrocard. Please take my $20 and give me back my Metrocard and receipt. Thank you. Participating in community activities: Hi, two tickets for the 12:00 showing of Muppets Most Wanted, please. Here is $25, please give me back the change, tickets, and receipt. Thank you. Asking for help: Hi I need help, could you please call (212) 555-1234 and tell them where I am? They will pick me up. Laminate the cards for repeated use. Multiple cards can be strung together. Consider ways to facilitate transaction using cards. Start with an activity that has a quick, tangible result (e.g. buying a cup of coffee). Practice exchanging the card for the desired item, either through role play or in a real situation. Clinician or support worker should accompany individual to the location where the request typically takes place and model handing over the request card. Hand-over-hand support can be provided if necessary, with gradual reduction of support over time. Additional modifications can be made as needed, depending on the user’s communicative level (see below). The Teachers College, Columbia University Program in Speech-Language Pathology has implemented a form of community request cards in an annual international trip to Ghana. Ghanaian families reported that one of the primary chores for children is fetching food from the local market. The AAC Market cards included a hand-drawn picture of the desired food item, along with the written name and a quantity. They could be given to the market vendors to request items to purchase. This approach has been highly successful in the communities where it is used, and has been well-received by both families and market vendors. Find other Contemporary Approaches to Intervention here! Price, E. (2014). Augmentative and Alternative Communication (AAC) Approaches [Brochure]. Sunyani, Ghana: Program in Speech Language Pathology, Teachers College, Columbia University. Swipe through the gallery below for more examples!